This was a wonderful, but fairly hard-going hike. 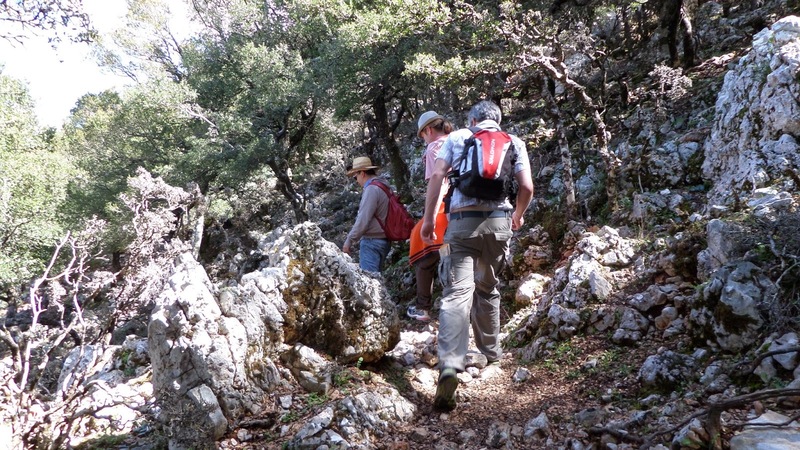 I'm not sure we were on an 'official' track some of the way, but hiking in Crete does tend to be a bit like that. 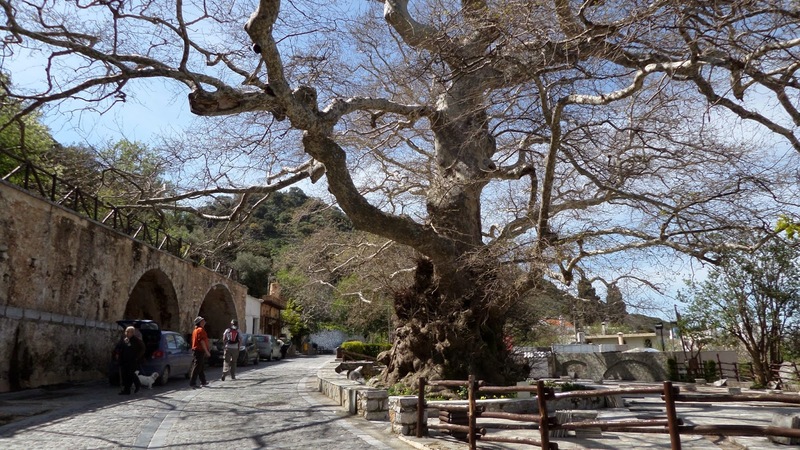 We set off, one beautiful sunny morning in late March, from the village of Krasi near Malia. (Since we met up in a kafenio, we had to have a quick coffee and cheese pie before setting off, of course, it would have been rude not to. I wrote about that here). On the road leading out of the village we found a (not particularly informative) information panel, half-heartedly marking some nearby routes, but not providing much detail on how to find them, how long they took etc etc. It didn't matter. After a couple of turns walking through the village, arguing amongst ourselves, we found some locals who were happy to help the crazy foreigners get themselves lost in the mountains. After about an hour or so walking, the path became a bit steeper and less maintained. It wasn't quite scrambling terrain, but still quite hard work walking over loose stones and scree. Our two dogs (Betty and Poppy) didn't seem to have any problem with it, but they have had a few years of training by now. 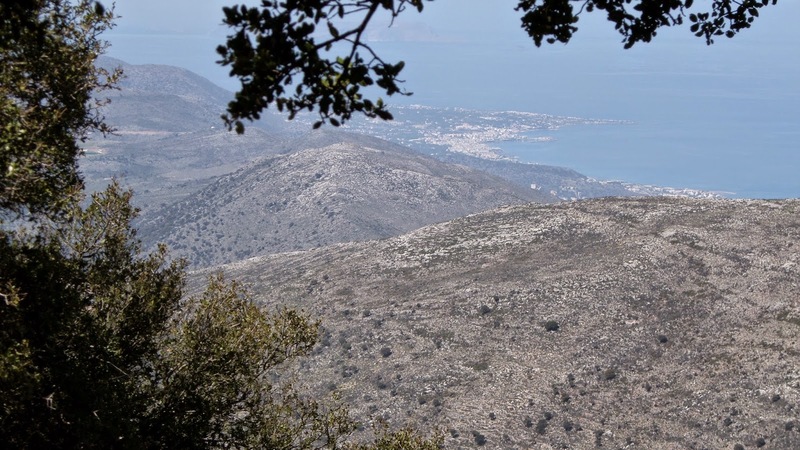 On the way up the mountain we had spectacular views down towards the North coast of Crete. 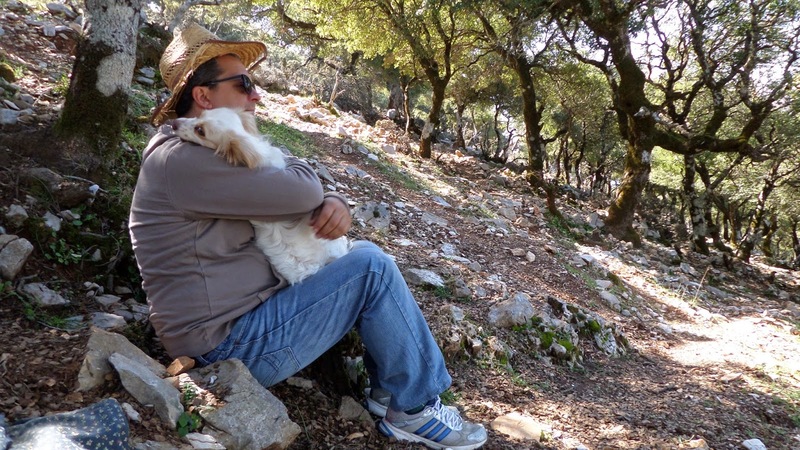 This area of East Crete is quite green, especially in early Spring, mainly due to the olive groves. This contrasts beautifully with the brilliant blue of the sea. At some point we felt sure we could see land, out over the sea on the horizon - if so, we figured it must be Santorini! Just clouds on the horizon - or another island? Even in March it can get pretty hot hiking in the mountains. This definitely would not be a walk for high summer - there was very little shade. We did find a small shady area to sit, rest and water the dogs, but they were few and far between. From our rest point we were divided on whether to continue upwards, or to count our losses and rush back down for the bbq that was waiting for us down on the coast. The peak seemed tantalisingly close, however, so we pressed on for the top. For this last section I feel we did lose the path a bit, and just cut our own path through the rocks. It was fairly steep, and exhausting. But, when we got to the top, the view was so unexpected and breathtaking, you instantly forgot how tired you were from the climb. 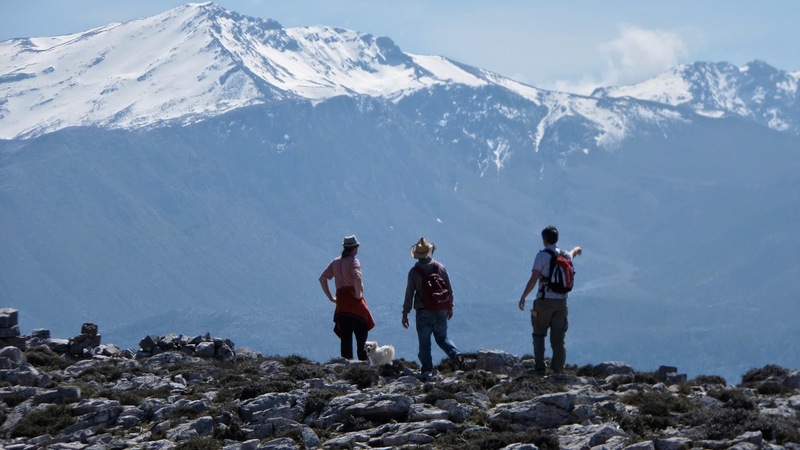 The landscape changes dramatically from one side of the mountain to the other - instead of a mountainous view down to the coast, you have the fertile Nissimos Plateau with an incredible backdrop of snowy mountains! I'd love to go back one day and explore the Plateau. Up on the slopes of the snowy mountains behind, a friend also pointed out a refuge for hikers, which I'd love to go and stay in. 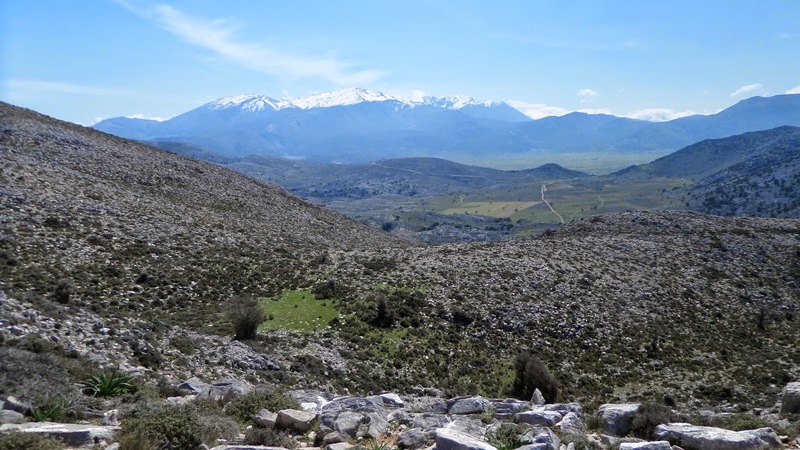 It would be great to pass over those mountains and reach the Lasithi Plateau. 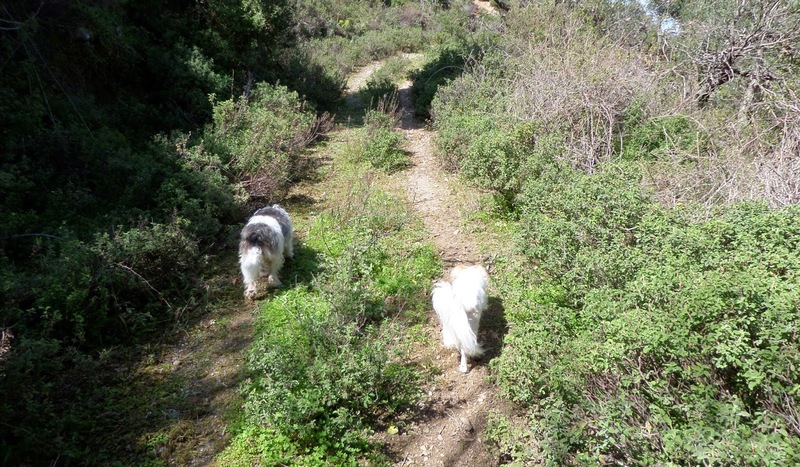 So we just admired the view, watered the dogs (again), and started the walk back down. 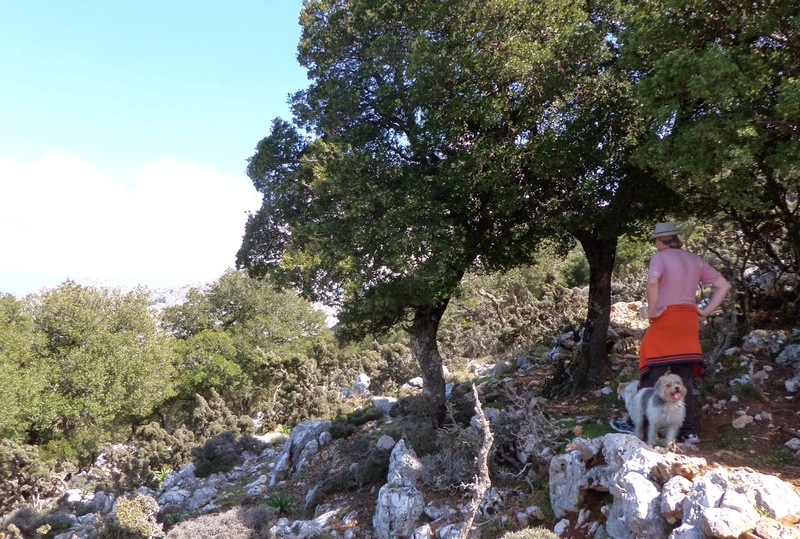 Sadly, we didn't find the archaeological site of Karfi, although I think we were very close. 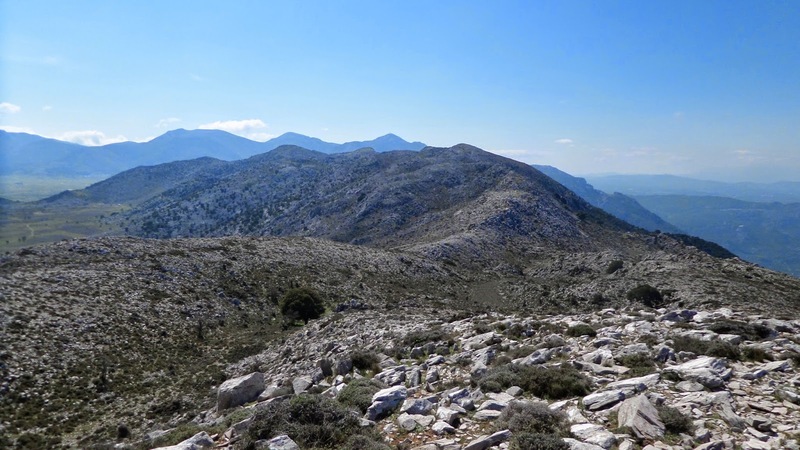 We also didn't manage to find a circular route - all deciding it was safer (if we wanted to be in time for the bbq that is) to go back the way we'd come. The hike took us about 3-4 hours, with 2 short stops. As I mentioned at the start, it was quite hard work and there is little shade. But it's a lovely walk for Spring or Autumn - I'd say particularly in Spring when you get to see the mountains looking this glorious. 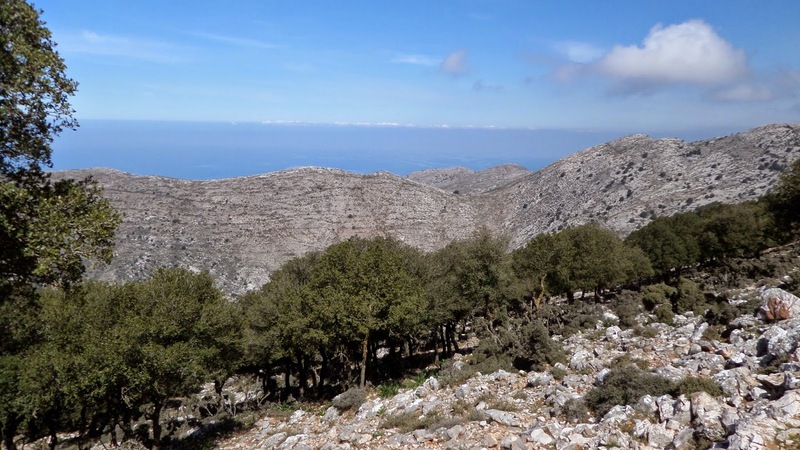 It would be good to find a circular route, so as to see more of the landscape, and an overnight stay somewhere in the mountain villages or at the refuge would mean you could get to see a whole lot more of the mountains around the Nissimos and Lasithi Plateaus. 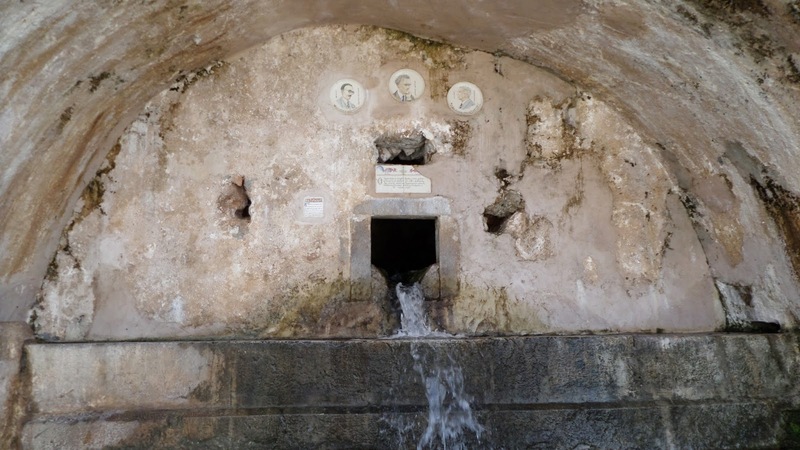 Do bring your dogs, it's definitely manageable for dogs of all sizes, just carry water for them as you won't find any after the fountain at Krasi. 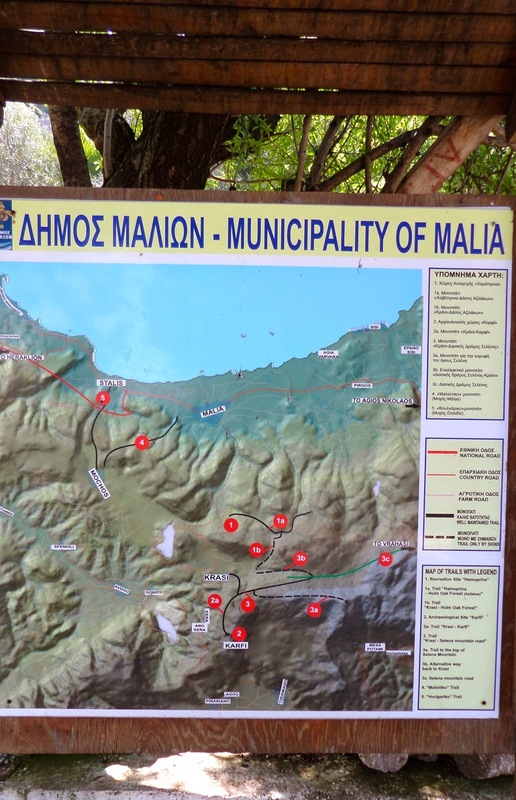 You can always contact the Mountaineering Club of Heraklion for more information on routes in this area, and staying at the refuge.